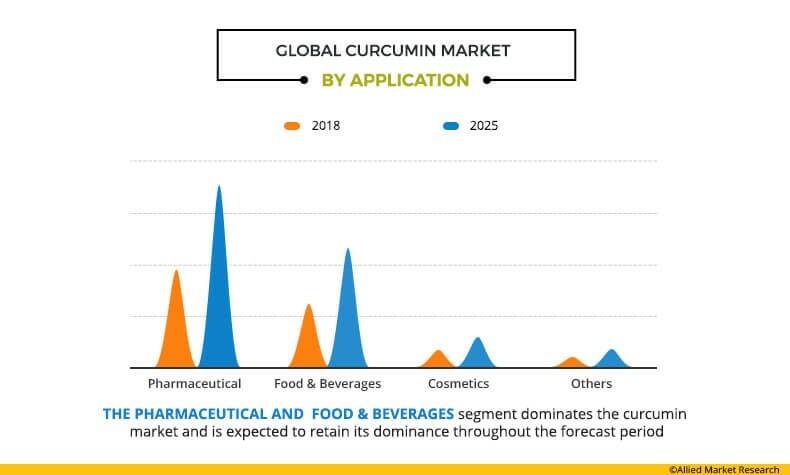 The global curcumin market was valued at $52.45 million in 2017, and is projected to reach $104.19 million by 2025, registering a CAGR of 8.9% from 2018 to 2025. Curcumin is a bioactive compound found in the root of Curcuma longa also known as turmeric. Curcumin exhibits anti-inflammatory and anti-oxidation properties that make it an ideal ingredient in many medical and food applications. The curcumin market is expected to witness a huge development due to growth in consumer awareness regarding its therapeutic properties. Enhanced health consciousness, multiple health benefits of curcumin, and increased need of natural & organic supplements have fueled the demand for curcumin in the past few years, thus propelling the growth of the curcumin market. In addition, factors such as living a healthy life, rise in demand for organic-based foods as well as ayurvedic medicinal formulations, and innovations in pharmaceutical & skincare products using curcumin have supplemented the growth of the global curcumin market. However, the presence of cheaper synthetic food colorants and formulation challenges in curcumin-based products affect the growth of the market. Inclusion of curcumin in ayurvedic as well as herbal nutritional supplements and skincare products is expected to increase the popularity and demand for curcumin in the coming years. The report on the global curcumin market is segmented based on application and geography. Based on application, the report includes pharmaceutical, food & beverage, cosmetic, and others. Based on region, the market is analyzed across North America, Europe, Asia-Pacific, and LAMEA. North America was the largest market for curcumin, both, in terms of value and volume in 2017. Factors such as growth in population, increase in health awareness and introduction of innovative products propel the growth of curcumin. The Europe region is projected to be the fastest-growing market in terms of value and is estimated to grow at a CAGR of 9.5% during the forecast period. This development is predominantly determined by the increase in consumer expenditure on pharmaceutical and nourishment products along with positive regulations improving its overall market. Pharmaceutical was the largest segment that accounted for more than half the share of the global industry revenue in 2017. Curcumin is used as an important ingredient in many medical and food applications owing to its anti-inflammatory, antioxidant, and cartilage building properties. Pharmaceutical industries are actively trying to formulate curcumin-based medicines in the form of powder, capsules, and syrups for treatment of numerous diseases and health problems such as healing wounds, treating sprains, arthritis, liver problems, diabetes, gastric problems, Alzheimer, and migraine. Increase in scope of its application in the pharmaceutical and cosmetic industry is expected to boost the growth of the curcumin market during the forecast period. The key players operating in this market are Biomax Life Sciences Ltd., Synthite Industries Ltd., BioThrive Sciences, Konark Herbals & Health Care, Arjuna Natural Extracts Ltd., SV Agrofood, Star Hi Herbs Pvt. Ltd, NOW Foods, Phyo life Sciences and Herboveda India Pvt. Ltd. 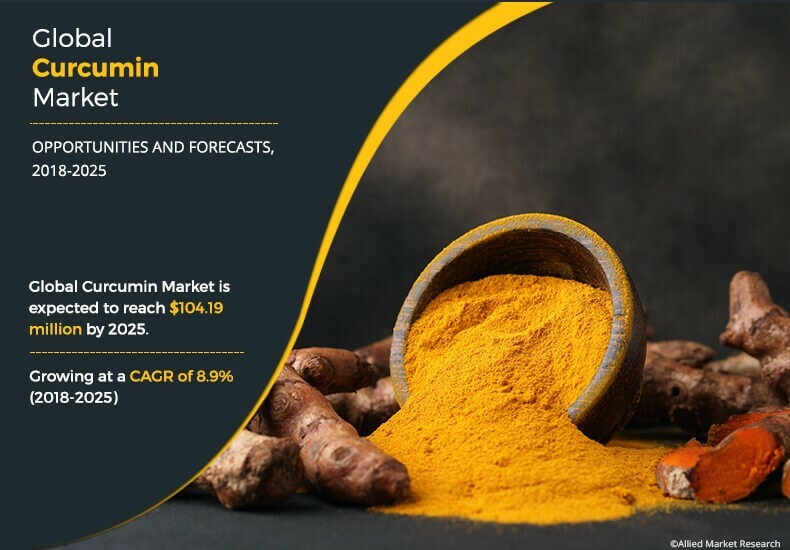 The report provides a quantitative analysis of the current trends, estimations, and dynamics of the global curcumin market for the period of 2018-2025 to identify the prevailing market opportunities. A comprehensive analysis of the factors that drive and restrict the growth of curcumin market is provided. In-depth analysis of the curcumin market segmentation assists in determining the prevailing market opportunities. 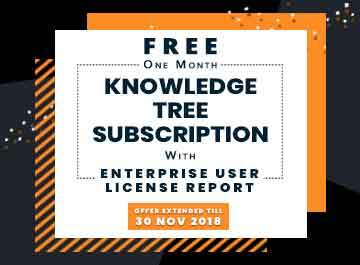 The report includes a detailed analysis of the regional as well as global market, the key players, market segments, application areas, and growth strategies. 6.1. Biomax Life Sciences Ltd.
6.10. Herboveda India Pvt. Ltd. 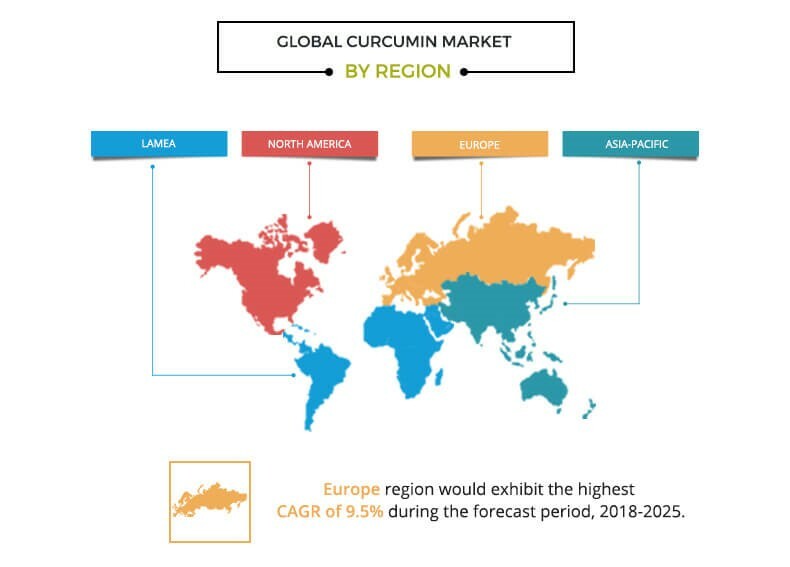 The global curcumin market is emerging at considerable pace owing to rise in health consciousness, consumer inclination towards healthy & natural food products, growth in demand for ayurvedic as well as herbal nutritional supplements and skincare products. Rise in consumer health consciousness due to presence of artificial ingredients in food, medicines, and cosmetics are the key viewpoints affecting the business makers to incorporate natural organic ingredients in the product formulation. Owing to its anti-inflammatory, antioxidant, and cartilage-building properties curcumin is used as an important ingredient in many medical and food applications. Pharmaceutical industries are actively trying to formulate curcumin-based medicines in the form of powder, capsules, and syrups for treatment of numerous diseases and health problems such as healing wounds, treating sprains, arthritis, liver problems, diabetes, gastric problems, Alzheimer, and migraine. In addition, increase in utilization of curcumin extracts in different beauty care products owing to its antioxidant feature is anticipated to move the item request in recent years. Growth in demand for ayurvedic and herbal skincare products as well as technological advancements and innovations in curcumin-based products offer promising opportunities for curcumin manufacturers in developed as well as developing regions such as Europe & Asia-Pacific. However, the presence of cheaper synthetic food colorants and formulation challenges in curcumin-based products, are expected to impede the market growth. Several companies are proactively investing in the development and expansion of their business to effectively cater to the needs of the consumer and tap the emerging markets. For instance, Arjuna Natural Ltd. opened a new production facility for curcumin based product in Coimbatore, India to increase its market share. In addition, exhaustive marketing campaigns by established companies have also increased brand awareness in the global curcumin industry; thus, leading to the growth of the market.